In our previous commentary, we explained that a target-date glide path cannot address all risks faced by retirement savers, and that the most important consideration for investment managers is sequence-of-returns (or sequence) risk. In this commentary, we will share our view on determining the overall shape of the glide path. Sequence risk will have an effect on all participants who depend on their portfolio for retirement income. Every traditional glide path that decreases equity over time is subject to sequence risk; however, where on the glide path a participant is most vulnerable — and where there is any resulting tradeoff — depends on how the investment manager chooses to address sequence risk. The best approach to designing a glide path to address sequence risk, we believe, requires an initial focus on the sensitivities of portfolio size, investor time horizon, and portfolio volatility. These factors are the reasons why sequence risk is greatest near and during retirement, and indicate that a risk parity portfolio allocation is most appropriate at these later stages of the glide path. One could logically propose that a glide path should start out as aggressive as possible, given that the portfolio balance/contributions are typically lower and the time horizon is long. It should then transition to become much more conservative around and in the retirement phase. This would necessitate a glide path that appears much steeper than the current industry average. The steepest part of the slope for this alternative glide path is where it is most vulnerable to sequence risk. Philosophically, it seems sensible that a portfolio would be most sensitive to sequence risk at a stage when a participant still has many levers to control in response. 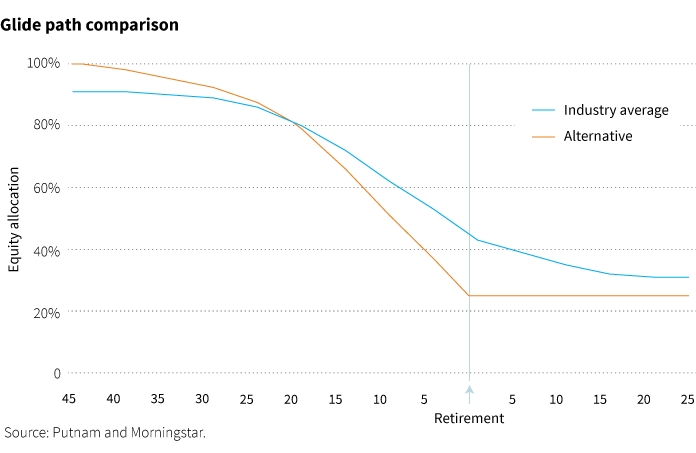 In the alternative glide path, this stress point is when the participant still has around 15 years to retirement. In the event of an adverse market event at this point, the participant has many other options to implement (e.g., increase savings, delay retirement), and can hopefully recover from the setback. In contrast, for glide paths that are more aggressive and/or continue to reduce equities in the distributions phase, the timing of this stress point often comes after retirement. Should an adverse market event occur after retirement, the ability of individuals to adjust their situation is much more limited. In another approach, managers may choose to deal with sequence risk by minimizing the size and/or frequency of portfolio reallocations, resulting in a much shallower, flatter shape to the retirement glide path. Conceptually this approach should minimize sequence risk at any point in time; however, it likely overemphasizes sequence risk early on at the expense of shortfall risk, failing to take advantage of the longer time horizon before withdrawals, while being too aggressive toward the maturity date, exposing the participant to much more volatility than needed. It is impossible to say a glide path is optimal, even under a certain set of assumptions. Instead, managers must first identify the most representative set of assumptions for the participant population, and then make hard decisions around the costs and benefits of managing the numerous risks facing participants at various points along the glide path. Of all the risks retirement plan participants face, sequence risk should be of the utmost concern to an investment manager, as this risk will impact those plan participants who will depend on their portfolio for retirement income. Avoiding a significant drawdown to the retirement portfolio near the retirement date is paramount. When these losses occur in close proximity to retirement, they have the potential to impair the retirement portfolio to such an extent that it may no longer be able to meet the needs of the plan participant throughout retirement. retirement. You can lose money by investing in the funds. 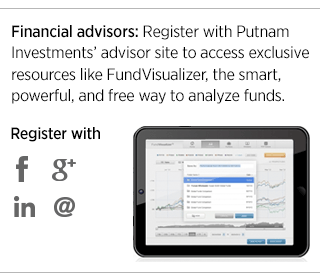 For the portion invested in Putnam Government Money Market Fund, these risks also apply: You can lose money by investing in the fund. Although the fund seeks to preserve the value of your investment at $1.00 per share, it cannot guarantee it will do so. The fund may impose a fee upon the sale of your shares or may temporarily suspend your ability to sell shares if the fund’s liquidity falls below certain required minimums because of market conditions or other factors. An investment in the fund is not insured or guaranteed by the Federal Deposit Insurance Corporation or any other government agency. The fund’s sponsor has no legal obligation to provide financial support to the fund, and you should not expect that the sponsor will provide financial support to the fund at any time.